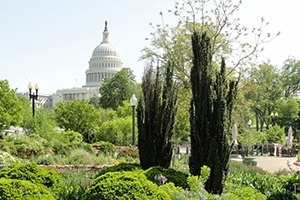 The Washington, D.C., area has many tranquil outdoor locations that are open to the public. Here are just a few options that are available when you are in need of a quiet place off campus to study or relax. Don’t miss: "Fountain of Light and Water" sculpture by Frederic Auguste Bartholdi (known for creating the Statue of Liberty), plantings that are continually updated, multiple seating areas. Intersection of Massachusetts Ave, Connecticut Ave, New Hampshire Ave, P St, and 19th St, NW. Don’t miss: Fountain featuring statue of Samuel F. Dupont (an admiral in the U.S. navy during the Civil War), chess tables, free fitness classes, frequent performing musicians, plentiful seating. The park curves along 10 acres of the Potomac from the Washington Harbour to Key Bridge. Don’t miss: A labyrinth, seating near the water, and views of the Kennedy Center, Roosevelt Island, Key Bridge, and the rowers on the Potomac. Don’t miss: Statues throughout the park, cascading basin fountains that form the center of the lower level formal garden, Sunday drum circle. Great place to bring a blanket and sit on the grass. The Arboretum grounds are open Friday through Monday 8:00 a.m. to 5:00 p.m. Admission is free. Don’t miss: The National Bonsai & Penjing Museum, National Herb Garden, and the National Capitol Columns. Great place to bring a blanket and sit on the grass. Don’t miss: 11" deep water feature open to the public, River Street Gardens with wooden chaise lounge chairs, river views, free concerts on Friday nights, free outdoor fitness classes, and many seating options. Don’t miss: Designed by Frederick Law Olmsted, Jr., this medieval garden has two herb gardens, a rose garden, two perennial borders, a Shadow House, and stone paths. There is a lawn area next to the garden where people usually bring blankets to sit on the grass.